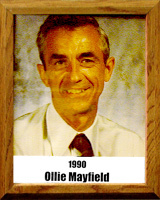 Mayfield was named Coach of the Year four times and Coach of the Decade for his football successes from 1970-80. A member of the University of Arizona Athletic Hall of Fame, he received the Bell & Howell Master Coaching Award in 1973. He ranks as Arizona’s third winningest high school football coach ever, percentage-wise, with a 103-35-1 record. In Nebraska his record was 33-17-1, giving him a career record of 144-55-2. In ten years as head coach at Tucson High School, he compiled an 81-23-1 mark, winning back-to-back state titles in 1970-71. His 1970 team was one of the all-time best in Arizona history, going 12-0 and destroying Sunnyslope, 54-16, in the championship game. All three running backs for THS rushed for more than 1,000 yards that season and the quarterback passed for 1,400 yards and 14 touchdowns as THS outscored opponents 475-158. Fourteen players earned college scholarships. He achieved 100 wins faster than any high school coach in Arizona history.